And now you can play either in land-based or online casinos. Today the latter are becoming more and more popular. This type is consedered to be reffered to the traditional slots. They have three drums that spin. When drums/reels stop, the combination of the symbols that you may see shows whether you have won or not. The five-reel slots have much in common with the three-reel slots but they have a larger number of combinations. As a result, there are more winning combinations and, of course, more pay lines. Straight slots have set payouts, which depend on the number of coins. For instance, if you deposited just 1 coin, tour win is 100 coins, 2 coins - 200 coins. Progressive slots differ from the regular ones in pretty large jackpots, which depend on other network slots. The jackpot is set by all the coins put into the machines. As long as nobody hits the jackpot, it will constantly increase. Modern computer technology and the Internet have led to the fact that classic slots transformed into video slots. Video slots belong to a new slots generation without mechanic reels but with a special screen that resembles the reels. You may find such video slots that have even 100 paylines. Can you imagine it? It is always pleasant to play such games, which offer you some kind of bonuses like Spin & Win money. You should know that some slots are capable to offer you some money and the others - bonus (free) game/games. 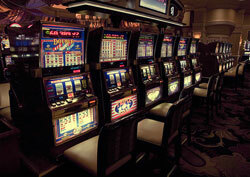 The main feature of these slot games is that you may play not only one game simultaneously. These slots allow you to hold the reels. If you have practiced with video slots, you will be able to play multi spin slots having 4 - 6 lines. You spin one reels` set, select what to hold and make re-spinning. Multi spin slots will give you unlimited excitement!